New rosters and player data are now available for NBA Live 18. The latest roster includes the Jahlil Okafor trade, and appears to be mostly up to date. There are a few errors with the rotations, but they can of course now be manually corrected using the new roster editing functionality. As always, the latest update will come through automatically when you fire up the game, as long as you have an active Internet connection. The new LIVESTRIKE Events are already underway, along with the Outfit of the Day Sweepstakes. If you’re on PlayStation 4 and would like to check out NBA Live 18, now’s a great time, as the game is currently on sale for $9.89 USD in the PlayStation Store. The deal is currently slated to end early in the new year. 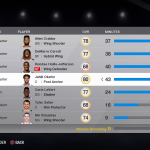 Feel free to share your thoughts on the latest roster update in the comments section below, and help us compile feedback on the rosters here in the NBA Live 18 section of the NLSC Forum. As a fan of the game I don’t like that $10 price point; I feel bad for them. It should at least be worth 30. Good to know that’s going away, since the next stepped seemed like it was going to be free. Fair point. I think at this point though, they’re just trying to get as many people into the game as possible. I’d liken it to a Steam sale where you can pick up some great games at bargain prices that don’t reflect the game’s overall quality. The game is clearly not a $10 title especially since they also added roster management too, I think it’s a great jesture to get some people the chance to play the game at a low price that probably would never bother with it and let them see all the work that is going into nba live to close that gap. In all honesty the only way Iam buying 2k this year is if it’s all a huge reduction. Agreed. It’s a good promotion, but I expect the price to go back up for the rest of its life cycle, barring another sale here and there.